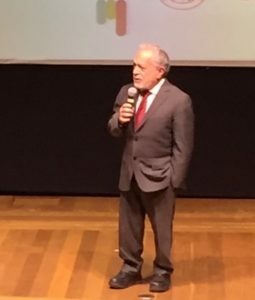 The day before the Pope’s arrival, my husband’s university, ISCTE-IUL, hosted another international dignitary, the former U.S. Secretary of Labor and progressive commentator Robert Reich. Reich’s presentation, “How Inequality in America Created Trump: A Warning for Europe,” was sponsored by the Socialist Party of Portugal (PS) and the Portuguese branch of the strategic communications group Res Publica. Robert Reich speaks at ISCTE-IUL. The almost-filled auditorium heard Reich speak, in English, about the forces of right-wing populism, which he defined as nationalism, scapegoating, broadly-directed anger, and xenophobia, and how they came to take over the U.S. government with the election of Trump and a Republican Congress. He argued that the process began in the late 1970s with deregulation of various industries under Democratic President Jimmy Carter. With deregulation came an assault on unions that accelerated under Ronald Reagan. The decline of unions – from a third of private sector employees in the mid-1970s to seven percent today – is one of the principal reasons for a drastic redistribution of wealth from the middle class to the very wealthy. Until recently, according to Reich, productivity increased in the U.S., but all the benefits went to a handful of people at the top. Their concentrated wealth led to a further concentration in corporate ownership (with the corresponding decline in small businesses) and political power. Reich observed that aggregate demand is now declining because of the disappearance of the middle class, and along with it is a decline in generosity as people cling to what they have hoping they will not slide into the ranks of the impoverished. He said that Americans are running out of coping mechanisms to hide their stagnating wages and loss of economic power. Already, women have gone back to work, people are working longer hours, and borrowing against rising real estate values – what caused the 2008 economic crisis and Great Recession – is no longer an option. 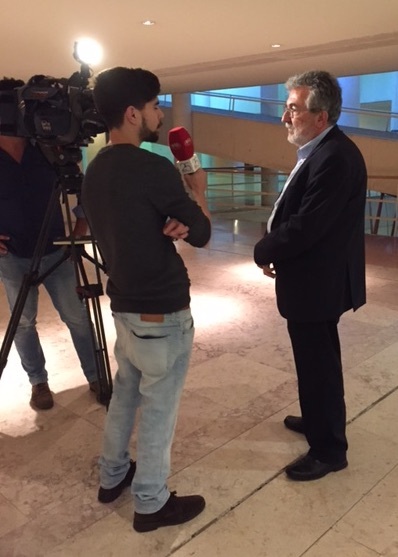 The organizer of Reich’s appearance, sociologist Rui Pena Pires (right), interviewed by the TV station. Speaking to a European audience, Reich compared the rise of inequality in the U.S. to austerity economics imposed by the “troika” (European Union, European Central Bank, European Commission). He noted that the countries that imposed austerity economics to pay off high levels of debt in fact ended up with even more debt because their economies stagnated or contracted. Only through economic growth can debt be paid off. Audience questions touched on the Trump administration’s open hostility to people of color and LGBTQ persons, the ability of the a two-party presidential (versus parliamentary) system to effect change, the “downward escalator” of education as well as economics in the U.S., debt restructuring in Europe, the role of social media in both Trump’s victory and the resistance against him, and the possibility of nuclear war with his finger of the button. As far as the move to impeach or remove Trump from office, Reich believed the chances of him leaving in the middle of his first term for any reason was one in three. Reich’s presentation at ISCTE-IUL coincided with his one-week holiday in Portugal, which he mainly spent in Lisbon. In coming to Portugal for vacation, he reaffirmed his hopeful vision of what the country has become over the last few years – a model for progressive governance, democratic participation, and the successful resistance to austerity. After all, he didn’t choose to spend his time in Russia, Turkey, or those countries of Eastern Europe where the slide into authoritarianism is testing the limits of EU standards for freedom of expression, human rights, and the rule of law. Our friends in Portugal are starting to express similar optimism, an optimism reinforced by the country’s leadership in a variety of areas from sports championships (such as the Euro Cup) to accolades in the arts (winning the Berlin Film Festival and the Eurovision song contest) to the realm of politics (the election of António Guterres as Secretary General of the United Nations). The world is indeed watching with hope. 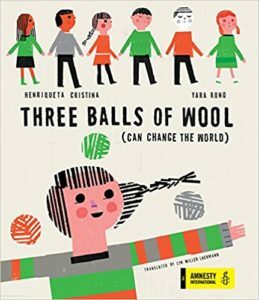 “The world is indeed watching with hope.” So true, Lyn. Great post! Thank you! Although I’ve read a lot of Reich’s articles, I had to go halfway around the world to see him. It always seems to work that way. What a nice post Lyn.